They really are one of the most inconvenient and fairly unattractive blemishes that our bodies produce. Not to mention, they usually pop up at the worst time – special functions, important work meetings. You get the point. We’ve heard before that a regular skincare routine that involves cleansing, moisturising, keeping well hydrated and eating well is essential to clear skin. However the location and appearance of your pimples are often indicators of a different, internal problem. 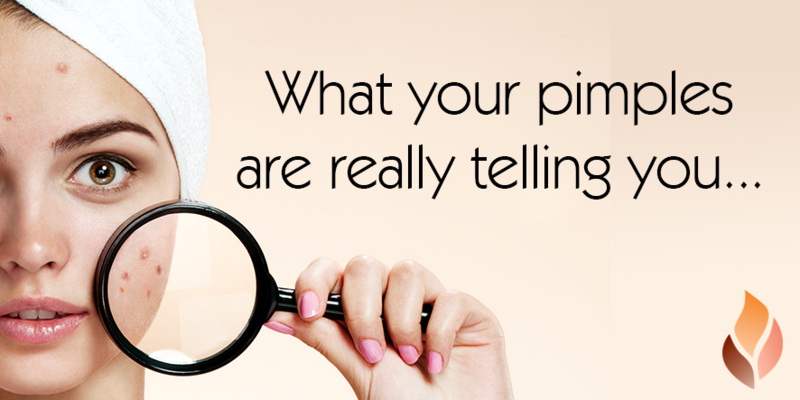 So, here’s your go-to guide for what your pimples are really telling you (and how to get rid of them)! Forehead Bladder/Small Intestine Pimples in this area are caused by poor food choices, stress, excessive alcohol consumption and reduced sleep! Keep hydrated, cut down on alcohol and eat plenty of the right types of foods. Consider taking a probiotic and maybe even digestive enzymes with your meals. Use meditation, breathing and yoga to reduce stress levels and to help with a good sleep. Between the Eyebrows Liver Pimples in this area mean the liver is working far too hard! This could be from eating too much meat or dairy or eating food that you’re sensitive to. Try reducing your intake of meat and dairy and fill your diet with organic fruits and vegetables. Ensure you are out in the fresh air! Meditate and practise yoga! Eyebrow Arch Kidneys Pimples in this area indicate dehydration in the body – whether it be from smoking, alcohol, poor salt consumption or a lack of water. Make sure you’re eating the right type of salt (such as Himalayan salt). Drink plenty of water and avoid highly sweet and caffeinated drinks and alcohol. Nose Heart Pimples in this area indicate high blood pressure, bad circulation and air pollution. Make sure you’re exercising regularly – even if it’s a 30 minute walk every day! Use green tea and chlorella to remove toxins from your body. Maintain healthy cholesterol levels and use cayenne and garlic to keep your blood pressure levels in check! Upper Cheeks Lungs Pimples in this area indicate problems with pollution, smoking and asthma. Avoid pollution and smoking. Ensure you have a regular exercise routine and incorporate green vegetable juices in your diet. Cheeks Lungs & Kidneys Pimples in this area are often a sign of a food intolerance such as dairy. Smoking, poor food choices and high stress levels will reflect on this area of the face. Eliminate dairy from your diet for one month and see if this has an impact on your skin. Ensure that you are nourishing the kidneys and the lungs with proper hydration such as pure water and sea salt. Add cucumber to your diet also! Mouth and Chin Stomach Pimples in this area reflect poor digestion or constipation. Consuming too much fat, sweets, caffeine and alcohol can cause this area to flare up. Drink plenty of water, exercise regularly and ensure you have enough fibre (such as chia and slippery elm) in your diet. Jawline, Neck, chest, back, shoulders Hormones Pimples in this area are hormonally triggered. Eating the wrong foods, being regularly exposed to artificial light, not grounding enough, not drinking enough water and eating hormone-injected meat and dairy can flare this area. Get grounding and get plenty of Vitamin D! Drink good quality water, eat healthy, nourishing foods and avoid hormone-contaminated foods! Zinc and Vitamin B6 can also help with naturally balancing your hormones.